6. List 8 things you accomplished this week! 1. 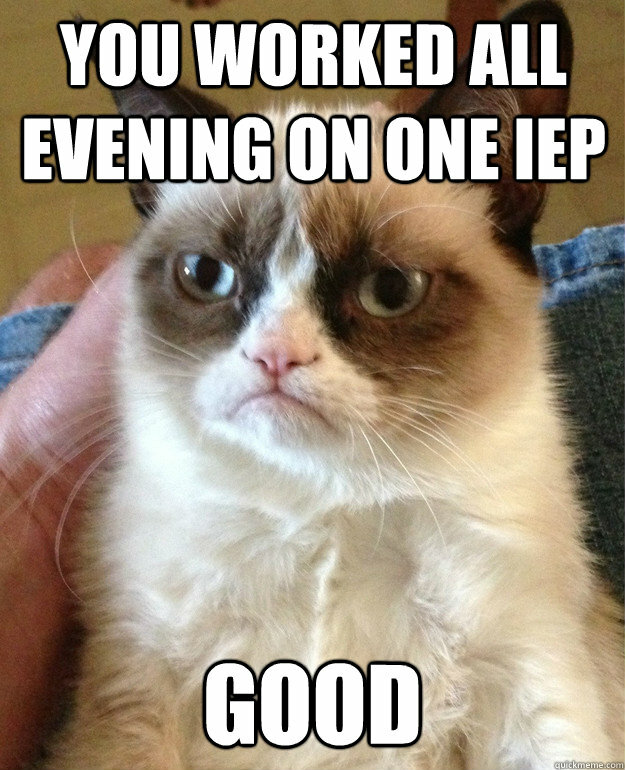 I finished writing another IEP for one of my students. So what is an IEP? It’s an Individualized Educational Plan. As an Intervention Specialist; aka Special Educator, this is what drives my instruction for my students. Each IEP takes at least four hours to complete – maybe more. Since there is so much info that needs to be put into the document, I can’t write one in one sitting. It takes many sittings to get one done. 2. I created a schedule for state testing next week. One of my co-workers came down to my room and helped me create the schedule. 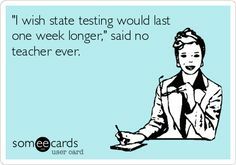 Knowing when I’m going to test my students helps me out. The Wee One just crossed over to Boy Scouts. We had to pay his Boy Scout dues. They wanted the money at his first meeting. However, I did not have it. Hubby made sure I had it for Tuesday’s meeting. The Wee One was suppose to remember to make sure we brought it to the meeting. We get to the meeting. I ask the Wee One if he had the money. Since he did not have the money, I had to drive home and get it. 4. I went for a strenuous walk / hike on Sunday. On Sunday, I was suppose to be writing on the IEP that I mentioned in the first accomplishment. However it was 62 degrees outside. When Hubby mentioned going geocaching, I decided to go with him. I took photos while he geocached. 5. I menu planned for the week. Life is so much easier when I menu plan. As soon as my car is parked in the driveway, the boys usually run out to my car and ask “What’s for dinner?” It’s easy to tell them when I have already menu planned. 6. I grocery shopped for the week. My family needs to eat so I needed to make sure we had food in the house. 7. I went through photos from years past. I’ve created a photo album on Facebook with photos of my sister. Since I went through those photos, I was able to add more photos to the Facebook album. My plan is to create a Shutterbug or Mixbook photo album with all of those photos. 8. I attempted to up my water intake. My Plant Nanny is not doing well at this moment. However, I’ve started to be more aware of how much water I’m drinking. So what have you accomplished this week? Thank you for visiting. Menu Planning helps because I can tell Hubby how he can help with getting dinner on the table. My son graduated to Boy Scouts this year, too! My son has an IEP so it was interesting to me to see it from the other side. I’d say you accomplished a lot! I like the look of your blog, by the way. Stopping by from Mama Kat’s. Thank you. I take a lot of pride with the ieps I write. You have been one busy lady but, what I really liked is that you took that nice day to go out with the family and enjoy it. It is easy to get wrapped up in busy but, those moments of being out as a family are impossible to get back if you let them slip by. I have always thought Geocaching sounded like such fun. I’ve been mostly cleaning and playing with the kids this week. Nothing to exciting. I’m glad I decided to take a break with my family. Hubby has been geocaching for the past 10 years. He loves it. I don’t have the patience for it. I would rather take photographs. I think we all need those days to recharge and focus on our selves and family. This week I accomplished going to the gym for three days, once even after a roller derby practice, getting my daughter to her orthodontist appointment, getting a new windshield in my car and cleaning up the yard of everyone else’s trash from that little tornado episode thing that happened Monday night. Also, we were a lot better at eating at home. I blame Hello Fresh. It’s freaking amazing. Wow! Good for you keeping busy! I agree about meal planning. I hate it when I don’t think ahead to do that and we end up eating the lamest dinners!